Aikido is a powerful, graceful art founded early in the 20th century by Morihei Ueshiba. Its decisive techniques include throws, joint locks, strikes and immobilizations, practiced within a context in which weapons (knife, sword, staff and others) are assumed to be present. Aikido philosophy is to avoid harming others whenever possible. 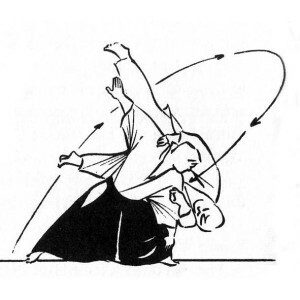 The essence of all Aikido techniques is spherical motion around a stable, energized center. Even when the direction appears to be linear, close observation reveals the Aikidoist’s movements are indeed circular. When properly executed, some techniques can be spectacular, sending ones opponent flying through the air. Other techniques utilize small, deft movements that can immobilize the opponent. Either result is achieved through the precise use of leverage, inertia, gravity, timing and the action of centrifugal and centripetal forces. Ultimately, it is the energy of the attack itself which brings down the attacker. Increased stamina, flexibility, reaction timing and muscle development occur naturally as a result of Aikido training, but the techniques themselves do not depend on strength for effectiveness; Aikido can be practiced by men and women of all ages and physical ability. The physical skills of Aikido include entering, blocking or avoidance movements, followed by throws or holds. After the opponent is on the ground, he is pinned. The system works because each person’s power is optimally utilized to lead the opponent in circles. The opponent essentially throws himself. Because Aikido does not rely on directly confronting strength with strength, and does emphasize skilled maneuvering, it enables a small person to effectively control a large person. A 60 year old can control a 20 year old; a less strong or lightweight person can control a stronger, heavier opponent.